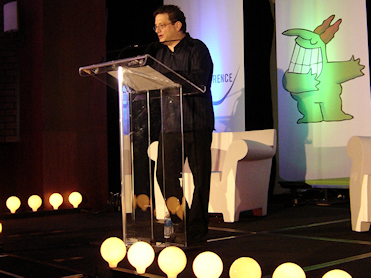 The hour we wait all year for (ok, I wait for… and Elon Gold waits for…you had to be there) was finally upon us this afternoon, as Andy Kindler delivered the 14th (really?!) annual State of the Industry Address at the Hyatt. Upon manager Bruce Smith coming up to tell Andy to move the extra mic blocking his face, Andy mused on the hotness of “partially obscured comedy”. “We know he’s a standup comic, let’s have him work in the middle of two microphones”. Andy is very sad about agent layoffs, “but would prefer to see layoffs of 100%”. Alternative titles to I’m a Celebrity, Get Me Out of Here: I’m a Celebrity, What did I Do To Deserve This Other Than This? I’m a Celebrity, Who Died and Prevented Me From Making These Horrible Choices?